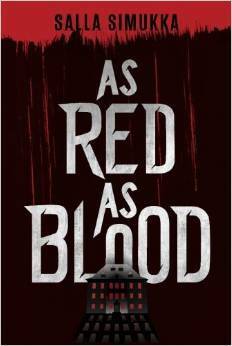 RuthLily Writes : Books I read in October! : Trollhunters, Carry On, As Red As Blood, Anything That Isn't This. Books I read in October! : Trollhunters, Carry On, As Red As Blood, Anything That Isn't This. 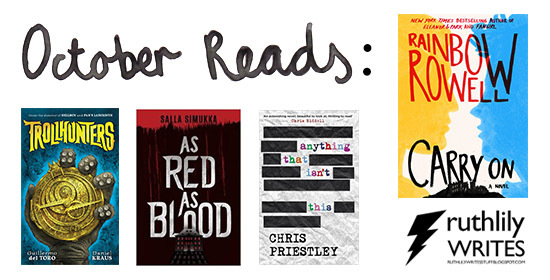 October reads! Books I read in October! Not late at all shh! I read Daniel Kraus and Guillermo del Toro's Trollhunters, Carry On by Rainbow Rowell, As Red As Blood by Salla Simukka, and Anything That Isn't This by Chris Priestley. 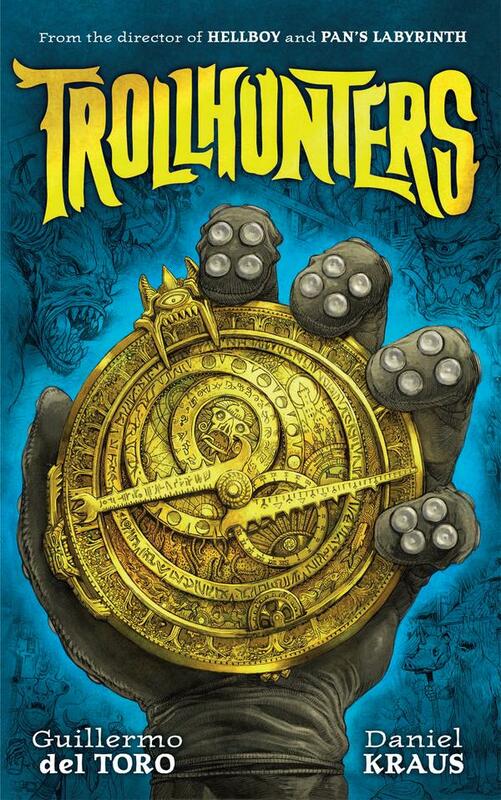 For some reason it took me absolutely ages to read Trollhunters so only 4 books read this month, which is perfectly reasonable really. I now also only one book away from by 50 book 2015 reading challenge woohoo! Set in San Bernardino, California, Trollhunters is about exactly that: hunting trolls. The trolls kidnap children to eat, leaving a slew of missing children reports behind them. 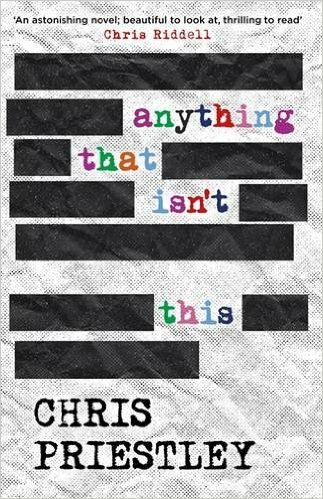 Jim Sturges Jr. has lived with the legacy of his uncle's disappearance during the milk carton epidemic in the 60s, with his father's high security house and paranoia as a lasting memory. Soon he is dragged away from his high school life into a troll war he has no choice but to be a part of. A very cinematic book, with plenty of action and adventure. And great illustrations throughout too! This book is so meta! In Rainbow Rowell's Fangirl Cath writes fanfiction based on a series of books about a magical character called Simon Snow, basically an alternate universe Harry Potter. Cath's fan fiction series called Carry On is immensely popular online. 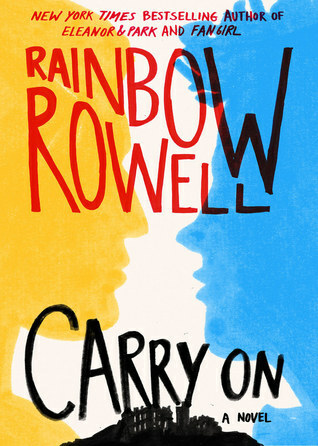 Rainbow Rowell's Carry On is basically Simon Snow fan fiction. Fan fiction based on a made up series in one of her own novels. META. I loved the Simon Snow parts of Fangirl so I was very much looking forward to this. It was a really fun read. I got right into the world and its history and characters. As advertised there was plenty of kissing and also magic and monsters. The actual book is really pretty too, with great dust cover and a ribbon to hold your place. This book is about murder and crime and drugs and stuff. Lumikki Andersson has a really good name and lives in Tampere, Finland, where she goes to high school. She gets caught up in a mess of corrupt officials and faceless drug king pins when she finds thousands of euros worth of notes hanging up to dry in the school's darkroom. This has everything I was looking for; snow, good Finnish names, corruption, mystery, murder, and dressing up. Lots of people in the reviews on Goodreads finding this book too weird, too dark, too dreary, but these were exactly the reasons why I enjoyed it. Set in a post-war city, with grim buildings and grim lives being led, seventeen-year-old Frank Palp hates his life and hopes for something more. Frank is in love in a tropey teenage boy in a YA book way, with a popular girl who he hardly knows, and has put up on a pedestal, but in this very surreal Kafkaesque setting Frank's romantic delusions are all part of his journey to understanding his reality. A great humour throughout, with his grandfather's stories told from his grave, and Frank's ministry job calling up everyone in the phone book. Humorous, surreal, weird, dark, grim, brilliant. Trollhunters, As Red As Blood, and Anything That Isn't This were sent to me in book form or through Netgalley in return for an honest review, affected in no way by the freeness of the book.